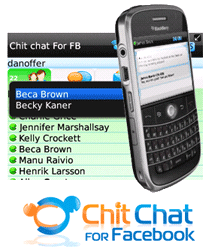 Chit Chat for Facebook (Blackberry), an application designed to provide Facebook chat on your Blackberry has recently been released by Athena IT Limited. Now, if you’re anything like me – when you’re on the move and you have a few moment’s spare I often find myself going into the Facebook application on my Blackberry and checking out my Facebook feeds. With the current Facebook application one thing that I can’t do so easily is engage and chat with my friends on the move – the Facebook Blackberry application simply isn’t designed for it. And that’s what Chit Chat for Facebook (Blackberry) is excellent at – allowing you to communicate with your Facebook friends on the move. The first thing you’ll notice about Chit Chat for Facebook (Blackberry) is its colourful, almost completely colour coded interface design – visually Chit Chat is very appealing. In terms of chat experience, Chit Chat deviates from the norm – and in my opinion, that’s a good thing particularly because you’re likely to have a lot of buddies when using your Blackberry on Facebook Chat. Uniquely sporting three “tabs” for your contacts – one for your ‘buddy list’, the second for your ‘active conversation’ list and the third for your unread message. Whilst different from what you’d normally expect from a chat application, you’ll find yourself at home with this interface design fairly quickly since you’ll notice how effective it is when chatting with your friends. Searching for friends really has been made super easy in this application, even for those of us with large buddy lists. Firstly, since offline Facebook friends are not shown by default you’ll only see your friends whom are online (you can show offline friends if you choose in preferences), secondly your Facebook friends can be sorted by last logged in or alphabetically and thirdly, friends can be filtered on each list by entering keys. Furthermore, you can quickly scroll your contacts by using shortcut keys such as the space bar (scroll by 10) and Alt + scroll quickly scrolls your buddy list to the top or bottom. Your spoilt for choice in ways to manage your buddy list, personally, I prefer the filter. If you’ve ever used other chat applications on your Blackberry, I’m sure that you’ll consider this buddy list management style to be an improvement to what you’re used to. When first starting a conversation with someone on Chit Chat (Blackberry) the first thing that you’ll notice is a nice deep blue gradient, and where messages that are sent and received are shown in bubbles. In short, it looks great. For those of you with an artistic disposition, you’ll be pleased to hear that that the conversation window can be customised to be shown in your favourite colour. That said, if you’re somewhat lazy – like me, the defaults are great. But if pink is your thing with green large text – you’re covered. Users with sight impairments may find this particularly useful. 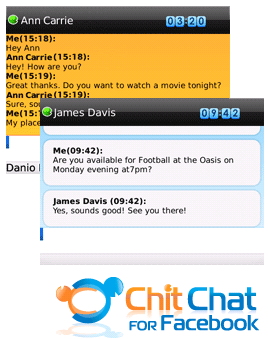 As you would expect from a Blackberry application designed for chat and communication, Chit Chat is very good at letting you know when a message has been received. Although, I would have liked to have seen inbox integration. The default setting for letting you know when a message is received is to vibrate, provide an audio notification and flash the light – kinetic, audio and visual notifications! Overkill? Moreover, if you’re actually using the app at that given moment that a message is received the application will let you know that a friend is typing to you. Exiting the conversation window and returning to the buddy list, will embolden the contact that sent you a message, although it’ll also appear on your unread message list. In case you forget you’ve received a message, a flashing icon at the top of the instant message screen will show you messages unread from other friends. In summary, the app is very good at enabling you to handle many Facebook chat conversations at once. Personally, however, I found the notifications a bit much and turned off the vibrate notification in “preferences.” On the subject of customisation, you’ll find that Chit Chat (Blackberry) can be customized in more ways than a Swiss Army pen knife – it lacks many of those restrictions that you find in other Blackberry apps. 9780, 9700, 9650, 9520, 9550, 9530, 9500, 9000, 8530, 8520, 8900, 8800, 8820, 8330, 8320, 8330, 8320, 8220, 8100, 8110, 8120 аnԁ the 8130.